I’m a huge fan of the Tour de France. 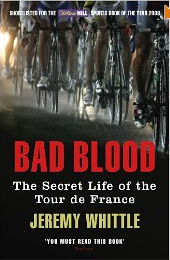 But after reading this book, my enjoyment has been mugged by the drug-invested reality of professional road cycling. David Millar is currently trying to overturn a lifetime Olympic ban. A time trialling phenomenon when he burst onto the scene at the turn of the millenium (he wore the yellow jersey), this is a vivid, pitiless look at how he came to take EPO. Aka, he cheated. Cue shame, a 2 year ban, a French courtroom, am eviction, bankruptcy, redemption, valediction. It’s excellent on the culture of pro cycling. Which stinks. And it leaves you in little doubt that the chances winning a major Tour ‘clean’ are… well, they’re not as high as one would wish. In other news, Lance Armstrong was “cleared” by US officials this week, while Alberto Contador saw his 2010 Tour de France victory struck off. The rider who came second in the 2010 Tour says he’s sure Contador didn’t mean to take the performance enhancing drug clenbuterol. Enough said. This book blows apart the peleton’s ruthless omerta. For that, David Millar deserves our respect. Safe to say this was a classic ‘follow on’ purchase. 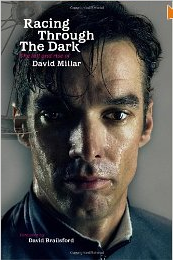 David Millar’s autobiography opened my eyes to just how prevalent and normalised doping had become in pro cycling. I had to read more; learn about its history, and the science. Whittle is an experienced journalist, and has covered the scene for years. He is very close to Millar and ‘helped’ him write his autobiography. Millar betrayed his trust, and Whittle’s “Good guys don’t dope” rose-tinted spectacles are forcibly removed. It’s not a pretty book, this. The litany of cheating. The complacency of the governing bodies. The cynicism of the teams. And the inevitable corrosion of innocence for anyone new to the ‘sport’, be they cyclists or journalists. I’d like to think Jeremy Whittle’s love of cycling shines through despite all, but he’s too honest a writer for such a cute conclusion. The love has gone. He admits to fearing he’s been complicit; this book a valedictory despatch. Ned Boulting is a TV sports reporter, best known for his coverage of the Tour de France for ITV4. 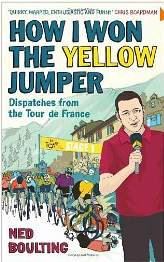 And this book tells you exactly what it’s like to cover the Tour de France for ITV4. More’s the pity. While sometimes painful reading, the previous two books are both liable to be finished in the early hours. The story they tell is too gripping, too appalling to allow sleep to intrude. This book isn’t like that. It’s dire. Ned and the crew traipse around France, eating well, sharing in-jokes and snatching meaningless interviews in hotel lobbies. It fails to make the making of TV interesting. Mainly, one suspects, because it just isn’t. Meanwhile, all around him, athletes were corrupting their bodies and souls. Of this, Ned makes little mention.